Welcome aboard RTA! If you're new to our system, kick back and enjoy, much like you would do on one of our buses or trains, and let this page explain how simple it is to use our system. Google Transit offers automated trip planning. All you need to do is enter the starting and ending points of your trip, and what day and time you would like to arrive or depart. Locate the route number closest to your starting point. Locate the route number closest to your destination. if the starting and ending route numbers are different, you will need to transfer. All 5-trip farecards include 2-1/2 hour transfer privileges, and time-based (All-Day, 7-Day, Monthly) farecards allow for unlimited usage during the time period. If you are paying cash, you will have to pay full fare on each bus or train you ride, and you must have exact change. Operators do not make change. If you need assistance, call the RTAnswerline at 216-621-9500. It is staffed Monday-Friday, 7 a.m.-6 p.m., and Saturdays from 8 a.m.-4:30 p.m. An RTA staffer will answer your questions. Be prepared to provide them with the address of your current location and the address of your destination. If you're using the bus, look for the round target symbol (Figure 1) to locate a stop. 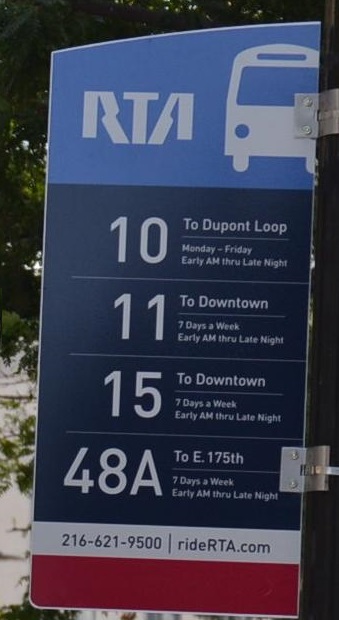 Some stops may also have route numbers listed on the sign (Figure 2). BUS: When your bus arrives, let it come to a complete stop, and board. Pay your fare with exact change, or swipe your pass or farecard through the farebox. PROOF OF PAYMENT: The Red Line Rapid and HealthLine BRT on Euclid Avenue use a Proof of Payment system. Be sure you pay your fare before you board. Ticket vending machines (TVMs) are located inside all Red Line Rapid Stations, and all HealthLine stations. Retain your activated farecard or pass until you exit the system. BLUE & GREEN LINES: Traveling westbound (toward downtown), pay your fare as you leave the train. Traveling eastbound (toward Shaker Heights), pay your fare when you board. Have a seat, chat with other riders, stare out the window, daydream, sleep, read, or do nothing at all - it's your choice. Operators announce all stops. When your stop is near, pull the stop cord or press the stop bar to signal the operator. If you're uncertain about your stop location, ask the operator. Repeat the process as necessary to reach your final destination. Until you get familiar with riding RTA, carry timetables/schedules with you. They are available online and at an RTA Customer Service Center. It's best to arrive at your stop at least 5 minutes early. The final destination for the bus/rapid will be listed on the front of the bus/rapid. Service animals are welcome without restrictions. Pets are welcome if they weigh no more than 25lbs. and stay in a pet carrier during your entire ride. Still unsure about using RTA services? Try Travel Training.